Antique c1890s quilt measuring 72 inches by 72 inches. Pattern is a 4 Patch. There are 149 blocks (arranged 13 across by 13 down), set on point, measuring about 3.25 inches by 3.25 inches. The alternating squares are a green solid and setting triangles is a grey chambray. There is no sashing, and 1 borders: 7.5 green print. It is pieced by machine, and hand quilted in a grid in the blocks chevrons in the border. The backing is a brown chambray. The binding is 3/8" wide, green solid, applied. 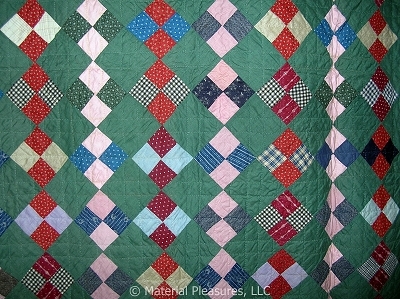 The color placement makes this quilt visually appealing. Notice how the pink and red squares are set to give a stripe illusion. Fabrics include typical 1890s fabrics: Indigo, claret, double green, double pinks, a pink sateen, stripes, plaids, and other solid chambrays. Condition is very good. I don't see any wear, holes, or spots. Please click on the Image Gallery for additional photos.